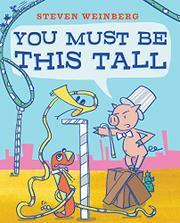 Tongue-in-cheek humor explores that age-old conundrum facing every child who is too short to ride some exciting attraction. Frank and Harold are best buddies enjoying a day at the fair. They are “slammin’! Ridin’! Spinnin’! Bouncin’!” But this fun cannot compare to that to be had on the Rattler, a big, twisty roller coaster that lights up their eyes and sets their hearts to racing. But to ride, they have to get past the pig in the bow tie and top hat with the measuring stick. Frank, a long, skinny, striped snake, has height to spare, but Harold, a short rattlesnake, does not. Suddenly the fair is not so much fun. But Frank won’t give up on the dream of riding the Rattler together. While his first two plans fail—a disguise and stretching on the flying trapeze—he still has one trick up his sleeve…or is that down his gullet? (And it doesn’t involve platform shoes.) Bright candy-colored watercolor, pencil, and digital illustrations capture the flavor of a fair, spots and double-page spreads used to great effect, and readers must rotate the book 90 degrees every time Harold tries to measure up next to an increasingly angry pig. Unfortunately, Weinberg never addresses the need for height requirements on amusement rides, even in an author’s note, leaving readers feeling that the rule is arbitrary and can be circumvented.